"There is no more powerful way to prove that we know something well than to draw a simple picture of it. And there is no more powerful way to see hidden solutions than to pick up a pen and draw out the pieces of our problem." He reveals that everyone is born with a talent for visual thinking, even those who swear they can't draw. 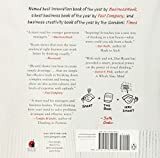 And he shows how thinking with pictures can help you discover and develop new ideas, solve problems in unexpected ways, and dramatically improve your ability to share your insights. Take Herb Kelleher and Rollin King, who figured out how to beat the traditional hub-and-spoke airlines with a bar napkin and a pen. Three dots to represent Dallas, Houston, and San Antonio. Three arrows to show direct flights. Problem solved, and the picture made it easy to sell Southwest Airlines to investors and customers. Now with more color, bigger pictures, and additional content, this new edition does an even better job of helping you literally see the world in a new way. Join the teachers, project managers, doctors, engineers, assembly-line workers, pilots, football coaches, marine drill instructors, financial analysts, students, parents, and lawyers who have discovered the power of solving problems with pictures.